The Tatham Art Gallery in Pietermaritzburg invites members of the public to attend the opening of the 2017 Standard Bank Young Artist for Visual Art, Beth Diane Armstrong. The exhibition is titled in perpetuum and will be opened by the artist herself. The opening will take the form of a walkabout conducted by the artist, and members of the public are invited to take advantage of this unique opportunity to interact with Armstrong. Armstrong highlights the use of sculpture to explore different expressions of density and looseness in relation to scale, structure, materiality, space, representation, and process. She received the Standard Bank Young Artist Award for Visual Art in 2017. “Enter the steel matrix” ... “Density and looseness in visual art,” says Armstrong. From a very early age, Armstrong was drawn to processing information this way, something that remains at the core of her practice. The physicality of the process and the way it manifests in space creates a kind of conceptual anchoring, a point of reference for other elements to stem from. “It’s only more recently that I have been able to articulate why it is that I love steel. Steel is not a fluid material; if you don’t commit your mark to the steel, it holds you accountable to it. “I think and feel in formal elements in relation to each other. The space is located in an old industrial suburb in eastern Joburg. “There is something intoxicating about this city, [like] the proximity of objects to you. Joburg is giving.” Armstrong draws on her immediate environment and is stimulated by the array of structures around her. She describes her practice as one defined by introspection – often working alone and in a state of contemplation. She uses the process of creating as a means of orientating herself within the world, following the trajectory of sensation, observation, translation and expression. “My internal world is very abstract. I think and feel in formal elements in relation to each other,” she says. A series of intersecting relationships are formed between the physical, emotional and psychological. When clad in a protective armour of woven navy fibres and a white visor, Armstrong’s work comes to life. A surge of fiery embers unites hollow steel poles together, controlled by skilled and nimble hands. The repetition of joins has a meditative quality. Often, the process is toilsome as she engages with the material. After much work, the rigid forms give in to her creative will. When approaching her work, Armstrong uses a combination of emotional intuition and rationality. “I have to resolve all mathematical and physical engineering well in advance. “Often, part of my process is to count things, order, measure, number and systematise. Those are more hidden processes, but are not altogether lost on the works. I often have pages of maths equations to ensure correct scaling. Days of complex understanding to ensure they are correct,” she says. She’s gathered years of experience through a process of trial and error to compensate for a lack of formal welding training. One could argue that perhaps it is because of this unrestrained experimentation between material and technique that she has been able to develop her own language within the medium. When using practice as research, she employs “problem-solving phenomena” in many of her projects. This approach operates under the conditions in which constructed obstacles are used as springboards of engagement. “It’s these parameters that allow me to enter a space of intuition and connective flow with the work. [They] are also flexible and changeable as the work develops, but there have to be parameters for me to be able to create.” A conceptual thread running through Armstrong’s work is ‘dynamic tension’, which is often understood in binary terms. According to her, “there is always a … push and pull between knowledge and ignorance in the creative process”. 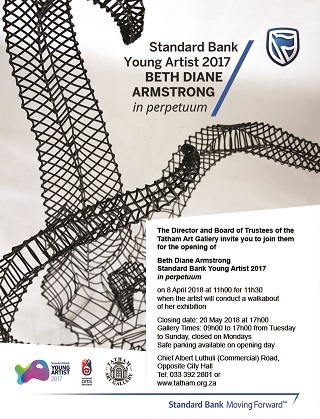 in perpetuum will open with a Walkabout at 11h00 on April 8, 2018, in the Tatham Art Gallery’s Main Exhibition Room. Entrance is free. The exhibition will close on May 20, 2018, at 17h00.